80+ 5* REVIEWS SAYS ALL! 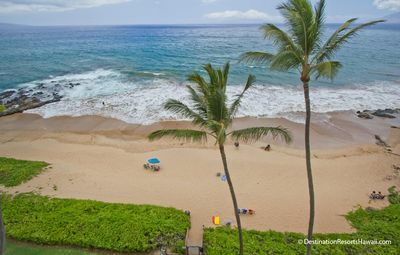 OCEAN/GOLF/REMOD/VAULTED/ FLR/last min specials! Please feel free to email me direct for information on my unit. 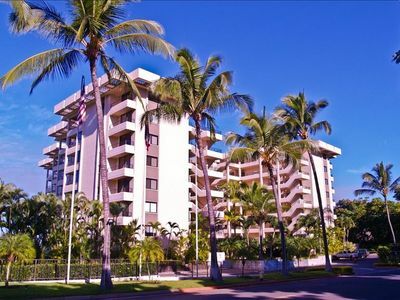 COME ENJOY OUR FULLY RENOVATED, TOP FLOOR CONDO WITH BEAUTIFUL OCEAN AND FAIRWAY VIEWS. 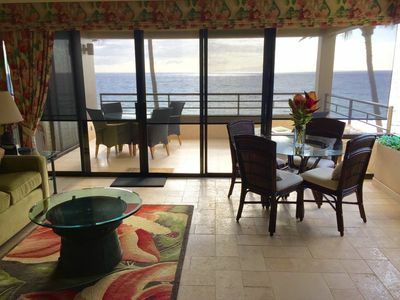 IF YOU ARE LOOKING FOR A ROMANTIC GETAWAY IN AN UPSCALE CONDO FURNISHED AND MAINTAINED FOR TWO ADULTS ONLY, YOU HAVE FOUND IT HERE! 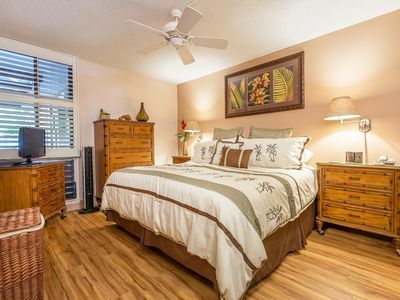 Our condo has been remodeled from top to bottom, We have beautiful carpet (new Nov 2017) and paint throughout, along with air conditioners (new 2016), big screen television, entertainment center in family room, and bedroom TV with built in DVD player, a water filtration system and lighting with dimmers throughout for a romantic atmosphere. 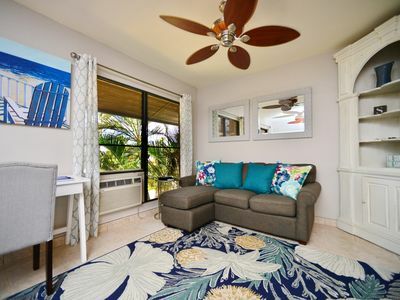 The kitchen has tile flooring, granite countertops, a hot water dispenser, stainless steel appliances with a refrigerator that has an ice maker and water dispenser. Our kitchen is kept fully stocked and dishware/glassware/utensils are all maintained in excellent condition. Both bathrooms have nice tile flooring and showers and granite counter tops (so no more old original white tiles in this unit!). We have two shower heads in the master shower, one being a ceiling mount rain shower head and the other a hand held option. Enjoy top quality furniture, especially the super comfortable sectional sofa (new Nov 2017), and king size bed (new Jan 2017) with top quality firm, but not too firm, mattress. 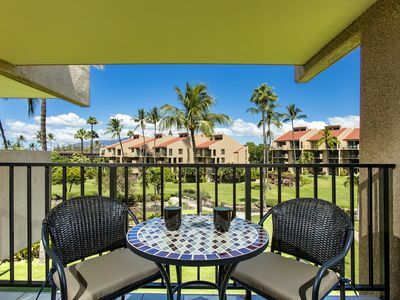 Located on the seventh fairway of the Wailea Blue Golf Course, our condo is on the top floor of a two story complex. 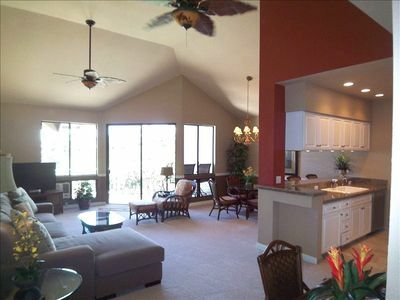 Unlike the bottom floor units, this unit has vaulted ceilings which makes it much more open and roomy. 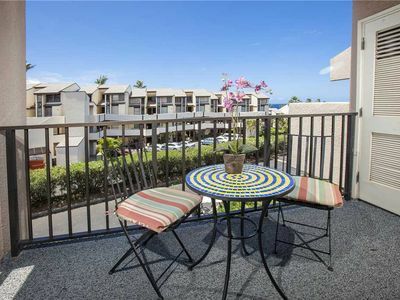 You can relax in your family room or sit outside on your private lanai and enjoy the beautiful ocean view without having to look over a neighbors roof top or a parking lot or see and hear cars traveling by. 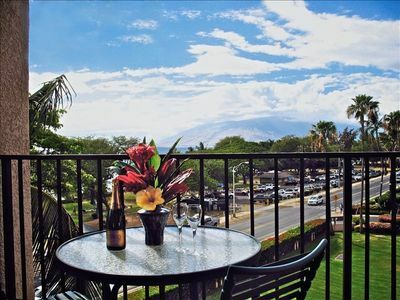 At sunset, watch the beautiful evening sky and feel the cool tropical breeze. It just doesn’t get any better than this! 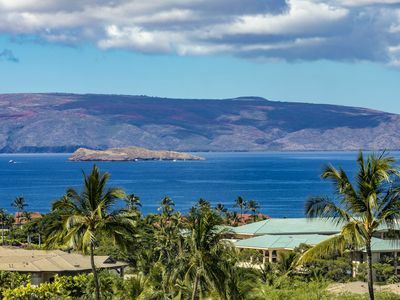 Grand Champions Villas is a first class luxury development in the heart of Wailea, with the Blue Golf Course on one side and the Wailea Tennis Club on the other. 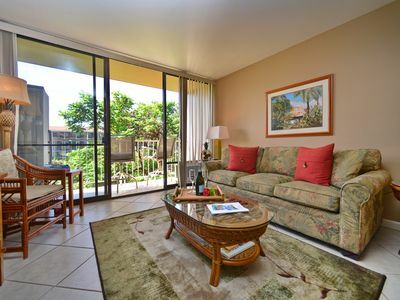 Both award winning facilities offer discount rates for condo guests. 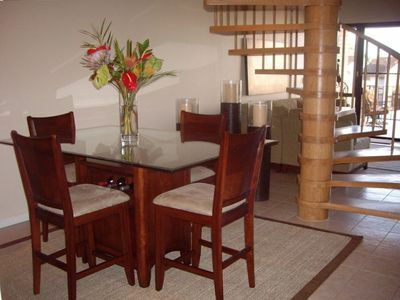 There are two swimming pool areas, each with a spa, shower and two large gas BBQs. There is a security entrance and you will have your own private parking space. 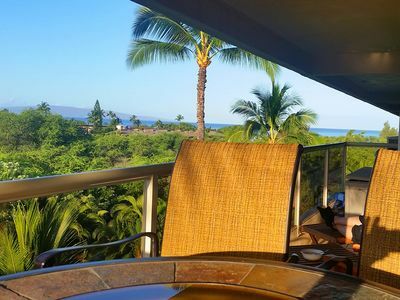 One half mile away, which is a beautiful 10 minute walk, you will find The Shops of Wailea, a two story outdoor mall with a wide assortment of stores and restaurants to choose from. 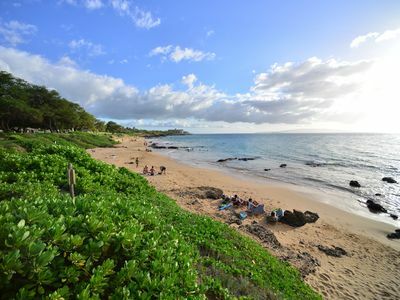 From there you can walk the paved path alongside the ocean and visit any of Wailea’s finest hotels which offer casual to fine dining and nightly entertainment. 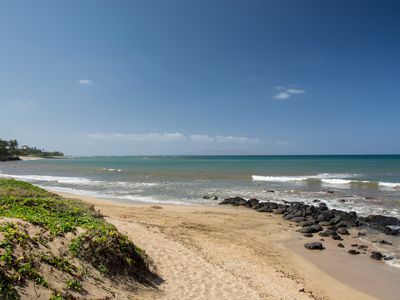 You won’t have a problem finding a great beach to snorkel and swim within walking distance or a short drive away. 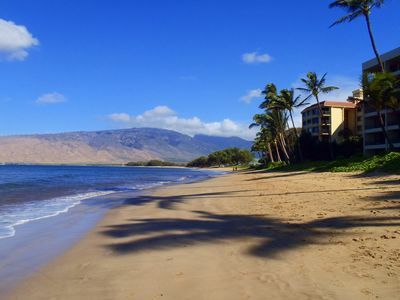 Come for a visit and you will find out why Maui is rated one of the top destination spots in the world. 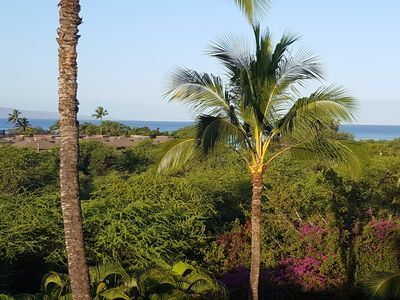 And you will find Wailea to be the paradise of Maui, with the least amount of rain and most amount of sunshine on the island. 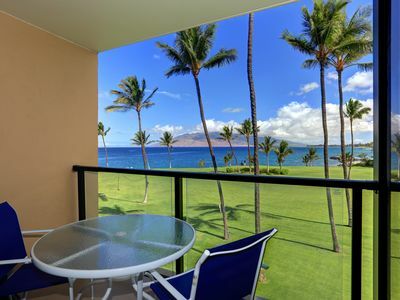 Top Floor Ocean View! Car Rental Options! 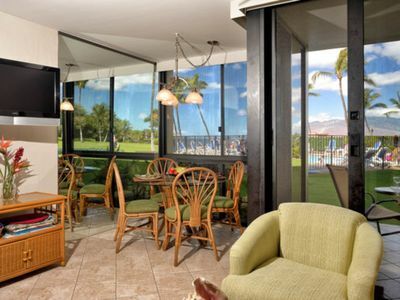 Best Value in South Kihei! 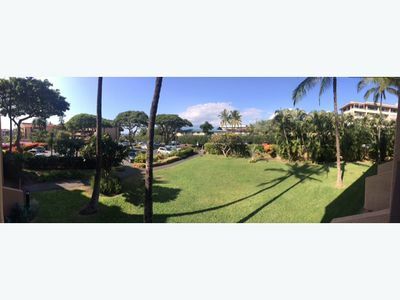 Private Ground Level Condo Steps from Kamaole 3! 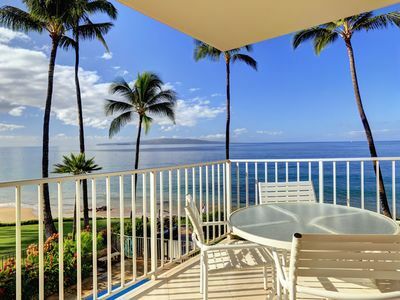 Ground level ocean view condo with all the amenities!